by Sarah - April 15th, 2014. 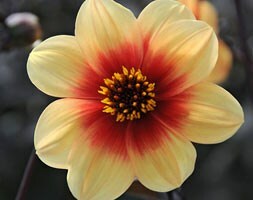 Position: full sun Soil: fertile, humus-rich soil Rate of growth: average Flowering period: July to September Flower colour: golden with an orange centre Other features: excellent cut-flowers Hardiness: half hardy (will need winter protection) Perfect for pots and containers, this relatively low-growing dahlia will produce an abundance of golden-yellow single flowers, each with a bright band or orange around their centre. The foliage is dark and flushed with purple, so this creates further interest as well as offering a stunning contrast to the flowerheads. Garden care: Dahlia tubers can be planted outside after frost, or started off in pots under glass in late winter to early spring. Plant them horizontally approximately 12cm deep, making sure the ‘eyes’ are uppermost. Allow enough room between each tuber so the plants can grow and spread to their full size without being over-crowded. While in growth, provide a high-nitrogen liquid feed each week in June, then a high-potash fertiliser each week from July to September. Stake with canes or brushwood if it becomes necessary. In mild areas, leave them in situ over winter, but protect the crown with a generous layer of dry mulch. In colder areas, carefully lift and clean the tubers once the first frosts have blackened the foliage and allow them to dry naturally indoors. Then place the dry tubers in a shallow tray, just covered with slightly moist potting compost, sand or vermiculite and store in a frost-free place until planting out again. Position: full sun Soil: fertile, humus-rich soil Rate of growth: average Flowering period: July to September Flower colour: pink Other features: excellent cut-flowers Hardiness: half hardy (may need winter protection) Pretty pink ‘petals’ form a single row around the brown eye, which turns bright golden yellow as the flowerhead matures. 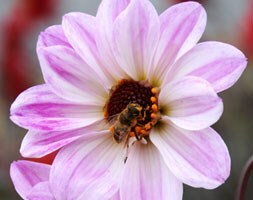 Popular with bees and other beneficial insects, the flowers will also make excellent additions to a vase. The foliage is attractive too and as it is flushed with rich bronze/purple, it will add a touch of drama to the border. 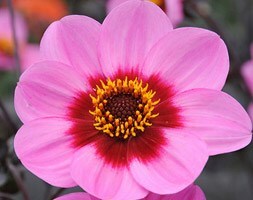 Garden care: Dahlia tubers can be planted outside after frost, or started off in pots under glass in late winter to early spring. Plant them horizontally approximately 12cm deep, making sure the ‘eyes’ are uppermost. Allow enough room between each tuber so the plants can grow and spread to their full size without being over-crowded. While in growth, provide a high-nitrogen liquid feed each week in June, then a high-potash fertiliser each week from July to September. Stake with canes or brushwood if it becomes necessary. In mild areas, leave them in situ over winter, but protect the crown with a generous layer of dry mulch. In colder areas, carefully lift and clean the tubers once the first frosts have blackened the foliage and allow them to dry naturally indoors. Then place the dry tubers in a shallow tray, just covered with slightly moist potting compost, sand or vermiculite and store in a frost-free place until planting out again. Position: full sun Soil: fertile, humus-rich soil Rate of growth: average Flowering period: July to September Flower colour: Pink Other features: excellent cut-flowers Hardiness: half hardy (may need winter protection) Iridescent lilac-pink petals, each with a rich plum base surround the central disc, forming charming flowerheads that are highlighted against the backdrop of the deep purple-bronze foliage. Excellent in a patio pot. Garden care: Dahlia tubers can be planted outside after frost, or started off in pots under glass in late winter to early spring. Plant them horizontally approximately 12cm deep, making sure the ‘eyes’ are uppermost. Allow enough room between each tuber so the plants can grow and spread to their full size without being over-crowded. While in growth, provide a high-nitrogen liquid feed each week in June, then a high-potash fertiliser each week from July to September. Stake with canes or brushwood if it becomes necessary. In mild areas, leave them in situ over winter, but protect the crown with a generous layer of dry mulch. In colder areas, carefully lift and clean the tubers once the first frosts have blackened the foliage and allow them to dry naturally indoors. Then place the dry tubers in a shallow tray, just covered with slightly moist potting compost, sand or vermiculite and store in a frost-free place until planting out again.